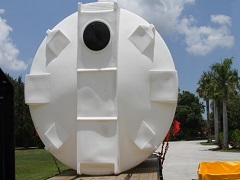 Many of our tanks are NFPA, FDA, NSF and AWWA compliant! Ask us about our materials, liners and accessories! Did you know corrugated tanks can be constructed for dual-use domestic and fire water storage? Open top tanks are rugged, portable tanks used for ground fire-fighting, aerial operations or as a reservoir tank. 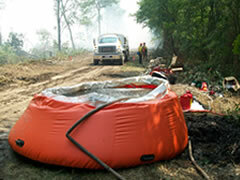 We provide a variety of water storage tanks for fire suppression. Whether you are seeking fire suppression tanks for your business in order to meet fire code compliance or you are a fire department that needs portable water storage for rural firefighting, we have a water storage tank to meet your needs. When the demand for fire water exceeds the available municipal water supply, fire water storage tanks are critical during an emergency. Corrugated steel tanks are popular in commercial, industrial and medical settings for new construction, fire suppression sprinklers or a backup water supply for firefighters from the tank's hydrant outlet. 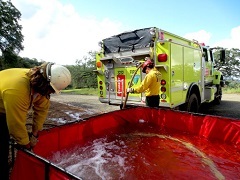 Open top onion tanks, folding frame tanks, and water trailers are rugged, portable water storage options that firefighters can easily use in remote areas prone to wildfires or during prescribed burns. Need a liquid storage solution? Call 772-646-0597 or request a quote. 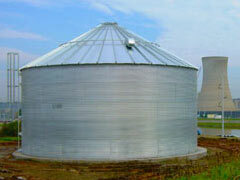 NFPA compliant, corrugated steel tanks are a durable option for fire protection water storage. 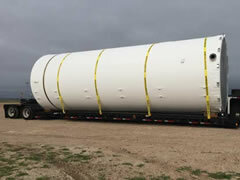 Fiberglass tanks resist corrosion and withstand extreme temperatures above or below ground. Folding frame tanks offer collapsible water storage for emergency relief or fire fighting water. Collapsible onion tanks or pumpkin tanks are durable and self-rising for convenient water storage. Plastic water storage tanks are a versatile solution for outdoor potable water or fire water storage. Mobile water tank systems include water trailers and spray equipment great for dust and fire suppression.